That isn’t a typo — it’s the name of a new customer of ours located in Malmo, Sweden (FYI: “matmarknad” translates to “food market” in English). 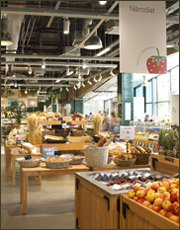 They were looking for high-end American made fixtures for their produce department, came across our webite and from there, a simple website lead turned into a new customer in Sweden. We offered assistance with store layout and design for a new fresh-market open display shopping environment. Our Evolution Orchard Bins were used along with some nesting tables and a few custom retail fixtures. As you can see from the photos here, the end result is a great looking store. They’re happy too and we look forward to a long-term relationship with them.